What is Home-Start Haringey Hackney and Waltham Forest? 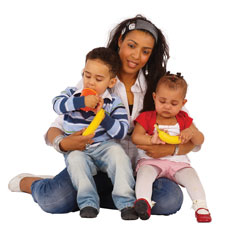 Home-Start Haringey Hackney and Waltham Forest is a charity with 12 years' experience of supporting families across the borough. We understand that many parents need help, friendship or support when their children are young, and we train volunteers who give practical and emotional support to families in their own homes for approximately 3-4 hours each week. Our volunteers come from all walks of life within the local community, and are normally but not necessarily parents themselves. Volunteers receive both initial and ongoing training, and are carefully matched with the family they support. After successful interviews, training and DBS checks, our volunteers are fully supported by our staff throughout their contact with families. We work very closely with other community groups, statutory services and Children's Centres to ensure we reach as much of the community as we can. "I've learnt that the way to help my child is to get involved. I have noticed when I get involved he does better. Having the service has been like having a friend, someone to talk to. It is hard to make friends. Just having a session once a week makes a difference." Another said of their volunteer: "She was very good, very encouraging. There were times, I didn't even feel I could go on, so it was good to have that one-one"